The newest Adrian Dominican Associates are, from left, Cheryl Boyce, who joined in May, Barbara Lawrence, Laurie Susie, Rev. Cathy Johnson, Joan Ebbitt, Mary Rooney, and Sherry Goff. August 9, 2017, Adrian, Michigan – Six women were formally welcomed as Adrian Dominican Associates on the evening of August 5 during Partners V, the fifth annual gathering of Associates. Associates are women and men – at least 18 years of age – who share in the vision and mission of the Adrian Dominican Sisters through a non-vowed commitment. Mary Lach, Director of Associate Life, presided over the Ritual of Acceptance, in St. Catherine Chapel at the Adrian Dominican Motherhouse. Deb Carter, Associate and member of the Associate Life Board, served as Ritual Leader, introducing each mentor, who in turn introduced the Associate she’d worked with. Laurie Susie, of Arizona, was born in Iowa and served in fundraising and development for non-profit organizations. She met the Adrian Dominican Sisters while serving at St. Rose Dominican Hospitals in Henderson, Nevada. In introducing her, Sister Carol Fleming, OP, her mentor, described her as compassionate, contemplative, and collaborative. “It’s been a joy to share her zeal,” she said. Rev. Cathy Johnson, a Presbyterian minister, is a pastoral chaplain at the Dominican Life Center, the residence of the retired Adrian Dominican Sisters. Cathy has ministered in three parishes in Michigan and two in Iowa, serving as a bereavement counselor, minister of visitation, and assistant pastor. “We are really blessed that she is sharing her pastoral ministry with us,” said Sister Joan Delaplane, OP, speaking on behalf of Cathy’s mentor, Sister Carol Coston, OP. Joan Ebbitt was born and raised in Adrian, met the Sisters at school and was in the Congregation as a vowed member for 10 years. A social worker, Joan specializes in addiction treatment and has given talks and workshops to religious leaders. She began an addiction treatment center as a joint venture with Parkside Medical Services at Baylor Medical in Dallas, Texas. In 2005, Joan started Companions in the Crossthreads, a group for former Sisters who wished to renew their connection to the Adrian Dominican Sisters. Joan also is a spiritual director who often offers spiritual direction and workshops at the Weber Retreat and Conference Center. Sherry Goff, a native of Adrian, attended Siena Heights College and completed her degree in sociology at Fayetteville State University in Fayetteville, North Carolina. While in North Carolina, she worked at the Mental Health Association, which provides services to adults who suffer with severe and persistent mental illness. After spending a year in Costa Rica as missionaries, Sherry and her husband, Stan, returned to Adrian, Michigan. Sherry has worked with Goodwill as the assistant to the Executive Director and in Human Resources. Sherry and Stan have three children and seven grandchildren. Barbara Lawrence, born in Mount Clemens, Michigan, studied at Siena Heights University and served as the university’s first Director of Human Resources. Since 2015, she has been a part-time receptionist at Weber Center, and is a catechist at her parish. Blessed with two children, two grandchildren, and one grandchild on the way, Barbara also cares for foster children. Mary Sweet Rooney entered the Adrian Dominican Congregation in 1954 with Sister Esther Kennedy, OP, who served as her mentor. While studying at Notre Dame University in the 1970s, she met and fell in love with Patrick Rooney, a Dominican priest. They married after Mary was released from her vows and Patrick was laicized. Living in South Bend, she served as Director of Ministries to Children and Families at a parish, was an adjunct faculty member at the University of Indiana and University of Notre Dame, and was a Chaplain and then Director of Pastoral and Social Service at Memorial Hospital of South Bend. Now retired, Mary volunteers with the Sisters of the Holy Cross. 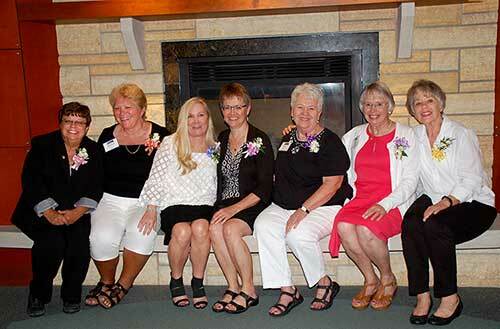 After the six new Associates were introduced and declared their willingness to be “named and known as an Adrian Dominican Associate,” Mary Lach introduced Cheryl Boyce, who had studied with the five new Associates from Michigan. Cheryl became an Associate in May 2017.